As you may know Ram Truck Brand is now separated from Dodge to make up its own identity. And they seem to have a new idea for business as well because they have made a special pickup truck that they say will appeal to the younger generation. Last time we checked the younger generation were more into hot hatchbacks and sportscars than trucks! But the simple fact of the matter is, the 2011 Ram 1500 Express Unveiled is a great pickup offering good value for money and plenty of personalization possibles. The truck is powered by the standard 20-mpg developing 390 horsepower and 407 lb.-ft. of torque. 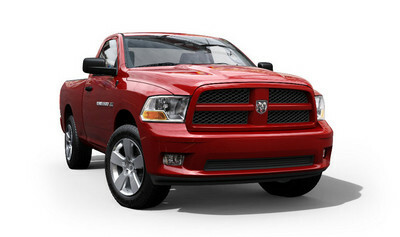 Ram 1500 Express comes as a regular cab, short-bed model, with a choice of 4×2 or 4×4 drivetrain. When equipped with an optional Class IV hitch, the new Ram 1500 Express will tow a maximum trailer weight of 10,450 lbs. There is loads and loads of standard and optional features for this pickup which we have listed below for you. Just so you know, sales of this model begins in the second quarter of 2011 starting at just $23,830. Standard features also include a 160-amp alternator, 26-gallon fuel tank, 3.55 rear axle ratio, 700-amp maintenance-free battery, four and seven-pin trailer wiring harness, heavy-duty front and rear shock absorbers, front and rear stabilizer bars, power rack-and-pinion steering, halogen headlamps, heavy-duty engine and transmission cooling and a full-size spare tire. Inside, the 1500 Express will get a heavy-duty vinyl 40/20/40 split-bench seat, and buyers will have a choice of vinyl or carpeted floor covering. Other features include air conditioning, an instrument cluster with tachometer and 120-mph speedometer, 12-volt auxiliary power outlet, four-spoke tilt steering wheel, six-speaker media center with CD and MP3 player, as well as audio jack input for mobile devices, automatic headlamps, behind-the-seat storage bins, driver and passenger assist handles, power accessory delay, rear dome lamp, rear-view day/night mirror, tinted glass windows, tip start and variable intermittent windshield wipers. Ram 1500 Express is available in Bright Silver Metallic, Bright White, Brilliant Black Crystal Pearl, Deep Cherry Red Crystal Pearl; Deep Water Blue Pearl; Flame Red, Hunter Green Pearl and Mineral Gray Metallic.